Temporarily relieves minor aches and pains due to: headache, muscular aches. 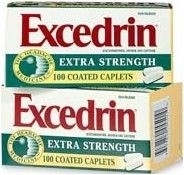 Do not use more than directed (see overdose warning). Adults and children 12 years of age and over: take 2 caplets every 6 hours; not more than 8 caplets in 24 hours. Children under 12 years of age: ask a doctor. Alcohol warning: If you consume 3 or more alcoholic drinks every day, ask your doctor whether you should take acetaminophen or other pain relievers/fever reducers. Acetaminophen may cause liver damage. Caffeine warning: The recommended dose of this product contains about as much caffeine as a cup of coffee. Limit the use of caffeine-containing medications, foods or beverages while taking this product because too much caffeine may cause nervousness, irritability, sleeplessness, and, occasionally, rapid heart beat. Do not use: with any other products containing acetaminophen. Taking more than directed may cause liver damage. Stop use and ask a doctor if: new symptoms occur; symptoms do not get better or worsen; painful area is red or swollen; pain gets worse or lasts for more than 10 days; fever gets worse or lasts for more than 3 days. If pregnant or breast-feeding, ask a health professional before use. Keep out of reach of children. Overdose warning: Taking more than the recommended dose can cause serious health problems. In case of overdose, get medical help or contact a Poison Control Center right away. Quick medical attention is critical for adults as well as for children even if you do not notice any signs or symptoms. Benzoic Acid; Carnauba Wax; Corn Starch; Croscarmellose Sodium; D&C Red #27 Lake, D&C Yellow #10 Lake; FD&C Blue #1 Lake; FD&C Red #40; Hypromellose; Magnesium Stearate; Methylparaben*; Microcrystalline Cellulose; Mineral Oil; Polysorbate 20; Povidone; Propylene Glycol; Propylparaben*; Simethicone Emulsion; Sorbitan Monolaurate; Stearic Acid; Titanium Dioxide; *May Contain These Ingredients "